This topic contains 4 replies, has 4 voices, and was last updated by hidflect 1 year, 9 months ago. Student loans are a $1T+ receivable to the U.S. government. Therefore, the U.S. bond market will collapse as students (already) don’t pay. They can’t. They don’t have the money because we don’t have an economy. That’s not even a taxpayer bailout really, it’s a systemic collapse and reboot. Newsflash: Obamacare ALREADY caused millions of people to lose their coverage. That was BECAUSE of the law. There are what, 47 counties with zero coverage, and 1,300 with one, while more insurers bail every day? Wisconsin, Indiana and Virginia are leaving. This is WITH the law. Also, barely anyone was added in the first place, because those reported as added were mostly added to the existing Medicaid system they were already eligible for, NOT Obamacare. Now that’s what I call affordable! 30% more than Switzerland or France to get no care whatsoever. I can only DREAM of having care as bad and as expensive as it was before the ACA, a mere $15,000/yr, when I might get service at a hospital, maybe, that wouldn’t bankrupt me. And the ACA exchanges and participation continues to collapse today, both among insurers and participants. …But don’t worry: we will very likely see the collapse of the entire United States because of it. Maybe then we can at last admit it’s not working. Or not, if history so far is any guide. 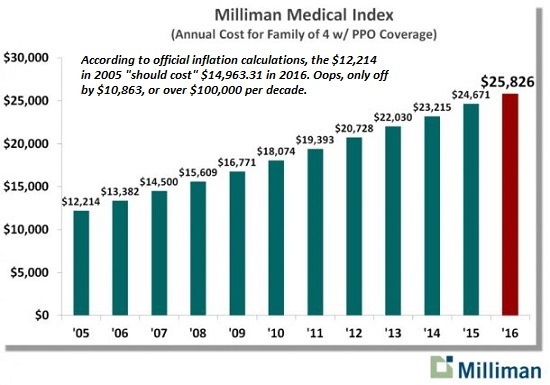 Meanwhile, no one will address the real problem: COSTS ARE TOO HIGH. And that’s clearly not due to the care — we’re getting almost no care, and little measurable success for the money spent. It’s strictly wasted in paperwork or funneled out to insurance profits and pharmaceutical companies, who have been so protected by bribery, we’re not even having the discussion of limiting profits. That’s equally or more true of bulk-rate Medicare as it is private care, because that’s how multi-billion dollar Congressional bribery works. And yet, you expect the same people who just spent 10-40 years PROTECTING the insurers and corporations while savaging the citizens at every turn to suddenly write single-payer laws that PROTECT the citizens and destroy the corporations…and collapse 20% of U.S. GDP, at first. What on earth would make you think after 40 years of killing citizens and destroying the health care system for profit, the exact same people would suddenly change their minds? That’s simply illogical. So I don’t know what MIGHT happen, or what’s possible in other nations, but in the U.S., either overall or just this point in history, no lawmaker, no law, and no one in medicine is going to do the right thing, slit their throats and spontaneously reform themselves while collapsing the outsized GDP of the nation during the transition. What that leaves as an option is anybody’s guess, but historically it usually involves a complete collapse, disarray, and a cash-only + charity system you see in other failed states. Sorry I can’t be more positive about it, but I live in those areas and down at those levels and have regular interactions with the system and its care. $4,000 for 6 stitches? Being admitted but not being seen in a hospital for 2 days? Those are the least bad outcomes. Accidentally killing people with poor practice and leviathan procedures AND charging $100,000 for the priviledge? All. The. Time. Please, please, please let’s not have someone as functional as the U.S. Congress help us. They’ve helped enough already. They can’t even help themselves. Helping! See us helping! We’re helping sooo much! When can I have back the terrible care I got in 1990? The USA cannot adopt a single payer health care system. Why? Because it won’t work? I don’t know, but with us Americans it’s a cultural thing. I know, VA, Medicare, Medicaid, but gosh darn it, we cannot imagine healthy, working age citizens getting good health care from the state. We just don’t believe it. And there the discussion ends. This cultural reluctance extends to a good portion of Democrats, so it’s not just a party issue. “Staving Off the Coming Global Overshoot Collapse”. A welcome point of view. The worst part about this issue is if you go on any of the popular social media forums and try to make even a subtle argument for some sort of ethical, non violent population control you get shouted down as a neo-nazi. People like David Attenborough have to be very quiet and circumspect when discussing the problem when instead, overpopulation should be shouted about from the rooftops. These self-righteously indignant trigglypuffs sitting behind their tablets are condemning the world to a human disaster measured in the 100’s of Millions. They think of themselves as being of “the left” with their campaigns for gender-free toilets and investigations into Putin but all I see are self-satisfied hypocrites.